Received this message last week and still can't think of a good sailboat name. Can you suggest one? Please post your ideas below the story. Thanks! 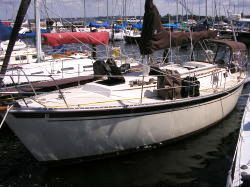 This is our third sailboat in three years. All Watkins, of course. Our Watkins 23XL is named Tovah, Hebrew meaning good. Currently the new boat is Ping An, a Watkins 36AC. We love sailing and hanging out on the boat. We are at a loss as to what to name the new boat. This is our retirement boat, we plan to go cruising when we retire in 5 to 7 years.